It’s been over a year since we first published this guide, and many new products have been released. After updated research and testing, we are resolute in our decision to choose the Moonlight Slumber Little Dreamer as nothing comes close to matching its value, lightweight design, or stain and water resistance. Infants will spend the majority of their early life in their cribs. Choosing the right mattress will help you and your baby rest easy at night. After 24 hours of research, I would buy the Moonlight Slumber Little Dreamer. It’s a great value, retailing for $196, and has an extra firm interior. We tested crib mattresses from 7 different manufacturers in our original tests, and decided to test two new products to see how they stacked up. These were the Lullaby Earth Breeze and the Newton Rest. We poured water on them, we sat on them, and placed them into several cribs to test their fit. Weights were placed to test their firmness, and we purposely stained each cover to see how easy they cleaned up. In choosing our best crib mattress, we consulted with manufacturers, doctors, retail associates, and real-world parents, and after all of that, the Moonlight Slumber Little Dreamer came out on top. While we’re all about value, the crib mattress is where your baby spends a huge portion of their day. At a minimum, you want a firm crib mattress that fits snugly into your crib. As a bonus, a waterproof cover and lower overall weight are great attributes, but they do tend to add to the cost. At about 20 pounds and an ungainly shape, a crib mattress becomes difficult to pick up. When considering the fact that you’ll be cleaning off the surface and changing the sheets on a frequent basis, we advise on choosing something lightweight. For me, 20 pounds was a good number to look for, but for some smaller, or shorter parents, you may want to go even lighter. For those parents, two of our candidates, the Moonlight Slumber Little Dreamer, and the Lullaby Earth Eco Plus Lightweight were both under 10 pounds. With that in mind, purchasing a great mattress now will save you time, energy, and money. Our selection is for expectant parents looking for the best crib mattress, who aren’t really excited about using their friend’s hand-me-down. We interviewed Katie, the owner of Baby Grand, a family-owned baby gear store in Minnesota, to get some perspective from someone who has been providing guidance for parents for the past six years. We asked her why parents should spend so much on a mattress. What Makes A Good Crib Mattress? We’re all attracted to soft things for babies. But it’s truly important to follow the guidelines, as set by Dr. Moon and The American Academy of Pediatrics. There are mattresses that are available that feature two different sides with varying softness. These are commonly referred to as “dual-firmness” or “2-in-1” crib mattresses. These kind of mattresses have an extra-firm infant side, and an appropriately firm toddler side. We tested several models that had this feature. The exterior matters, too. In 2009, phthalates—harmful chemical compounds formed by phthalic acid—were banned from crib mattresses in the United States. These chemicals were used to increase the flexibility of PVCs, creating more durable crib mattresses that were soft yet water-resistant. In the past few years studies concerned with infants and phthalates have been widely publicized; phthalates have been shown to cause hormonal changes in animal tests. One 2009 study, done by The University of Washington, stated that phthalates were found in the urine of 80 percent of infants tested. With that in mind, most manufacturers now use materials such as food-grade polyethylene, nylon, or even organic cotton to coat their mattresses. Then there are mattress interiors. You have two options: coils or foam. We found that both can be excellent for creating a firm surface, but that traditional coils tend to weigh more. One of the most common complaints about mattresses is their weight. Imagine it’s 2 AM and you’re trying to change the sheet. The baby is wide-awake, and you’re attempting to free the second of four corners of your fitted sheet from underneath a 25-pound slab. Today’s foam based mattresses are made from new-age foams which are lighter than their coil-based counterparts. Models tested from Moonlight Slumber and Lullaby Earth were among the lightest we found available, weighing in at 8 and 7 pounds respectively. For a mattress’ interior filling, you want to make sure that it’s firm all around—and yup, there are certain products to avoid inside as well. Most of the nefarious chemicals are added as flame retardants. A few things to avoid: Polybrominated diephenyl ethers (PBDe), tris, antimony, and other toxic flame retardants. While there’s no universal standard that will tell you what’s best, look for trusted private certifications when buying. These include GreenGuard, Certi-Pur-US and GOTS. This at least informs the consumer that certain chemicals are not present. Our tested mattresses ranged in price from $169 up to $395. Anything cheaper lacked firmness or didn’t stand up to our testing. We started by testing mattress fit in several different cribs. While manufacturers say that standard cribs fit standard mattresses, we like to make sure. We then felt the various exterior materials, and noticed significant differences: some of the mattresses, like the Lullaby Earth Eco-Plus Lightweight, felt cold, and made a noticeable noise when we moved our hands over the surface. Others, like the NookSleep Pebble Pure, were silent and soft to the touch. Colored water might be fine for some, but we chose to use actual urine. We poured water onto their surfaces, and observed their water-repellent qualities. We pressed our hands (and briefly sat on) the mattresses, to see how well they stood up to pressure. For a more consistent test, I placed a 25-pound weight on each model and left it for 8 hours to simulate a night’s sleep on the mattress surface. This way we could see how resilient the foams were and if the weight did any damage to the surface or if it left any indentation in the foam. Each mattress that we considered was deemed firm enough, but the The Nook Sleep Pebble Pure, and the Naturepedic No Compromise Organic Cotton Ultra were the most firm. To be sure about our top pick’s stain resistance, we wanted to go above and beyond. Colored water might be fine for some, but we chose to use actual urine to confirm our pick’s waterproofing and stain-resistant qualities. We poured urine onto the surface of the mattress and let it sit for 10 minutes. After that, we followed the manufacturer’s suggestion of using a damp cloth, a mild soap, and warm water to remove the stain and odor. After spending the week with these mattresses, I’m excited to say that the Moonlight Slumber Little Dreamer is the one to get. It’s the best crib mattress on the market, with solid construction, superior materials, and low price. The Little Dreamer has squared edges, and the fit was snug in each crib we put it in. The cover material was waterproof yet soft, and warmed quickly to body temperature. 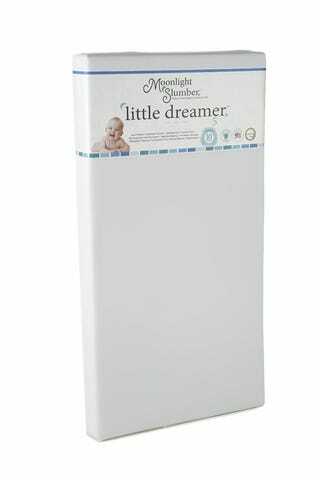 The Little Dreamer replaces coils with a CertiPur-us-certified foam. This means that it meets all of their standards, on top of any government or trade association regulations. Moonlight Slumber’s materials suppliers also meet these high standards. We really appreciated how the company’s website listed all of the various facilities where their products were tested. On top of that, you get a lifetime warranty on your product. With babies, you’ll have several upfront expenses, so thankfully the Little Dreamer isn’t too hard on the wallet, especially when amortizing the cost over the years that you’ll be using it—it’s significantly less than the proverbial cup of coffee per day. Some mattresses cost twice as much, but we still found flaws in their designs. All of the coil-based mattresses we tested were heavy, and even though they provide great support, they are typically more expensive. We think you can skip coils. One negative: The Little Dreamer lacks the bells and whistles like the Pebble Pure’s coconut coir interior, or the Lullaby Earth’s removable cover. It’s reliable and well made, but it won’t turn any heads when you’re showing off the nursery. Popular gear review site Baby Gizmo chose the Little Dreamer as one of its favorites, too. “Our hands-down favorite crib mattress comes from a mom-founded company and provides a safe, sumptuous product: Moonlight Slumber.” They claim to have tested every crib mattress on the market. On Amazon.com, the Little Dreamer currently has a score of 4.6 out of 5 (down from 4.9 of 5 when we first published our recommendation), with 90 percent of those reviews giving it a 4- or a 5-star rating. A recent reviewer stated, “finally found the perfect crib mattress.” That sentiment is echoed throughout the Little Dreamer’s many positive reviews. While theMoonlight Slumber Little Dreamer is reliable and well-made, it’s not the most exciting product available. That title belongs to the Nook Sleep Pebble Pure. The cost jumps from under $200 to $395. Yet we love the feel of its surface, its antimicrobial yet soft cover, and its extra-firm coconut coir interior. It’s a dual firmness mattress that has a “pebble-like” surface. Their focus is on breathability, hence the textured surface. Is it as good of a value as the Little Dreamer? No. It does however look great in orange. Even though the Moonlight Slumber Little Dreamer was our top pick for value and firmness, we would be remiss to not mention Naturepedic. Their mattresses range from $260 up to $360, and we really liked their No-Compromise Organic Cotton Classic Lightweight . This rings up at between $260 and $330 depending on if you want it with single- or dual-firmness levels and weighs only 12 pounds. While it does lack the value and lighter weight of our pick, the No-Compromise Organic Cotton Classic Lightweight is great for parents who want an organic cotton cover on their mattress. We did test the following mattresses, but chose the Little Dreamer for its all-around performance and superior materials. Naturalmat CoCo Mat—Too expensive at $400. No mention of being water-resistant or waterproof, so you’ll need a cover, which adds to the price tag. Lullaby Earth Eco-plus Lightweight—This mattress had a loud-sounding cover. Being the lightest candidate is attractive, but the Little Dreamer is only 1 pound heavier, with dual firmness levels. Sealy Soybean crib mattress—Soybean oil-based foam represents less than a quarter of the percentage of filling in this mattress. While the price may be attractive, this mattress just isn’t built to last. Edges start wearing down as toddlers get bigger, creating gaps and lasting imperfections in the sleep surface. Nook Pebble LIte—If you want a Nook mattress, get the Pebble Pure. The Lite isn’t nearly as firm, and lacks some of the high-end features of the Pure. Naturepedic No-Compromise Organic Cotton Ultra—Too heavy. This could’ve been our pick if it was about 10-pounds lighter. We did like the softness of the cover, and the steel edge support. Newton Rest—Brand new. We like a lot of the features on this, such as the washable cover and their air-flow interior core, but it’s too early to recommend this one just yet. We want to get more feedback and see how this stacks up over the long-run. Lullaby Earth Breeze—We like the concept but feel that it’s overpriced. The core mattress retails for $280 (LE14) making the cover an expensive $80 upcharge for a fancy sheet. Plus, we didn’t feel comfortable with the way the cover stained easily. The texture makes it hard to clean the surface. Most manufacturer’s recommend a damp cloth or sponge for quick cleaning. You want to clean any messes off of the mattress as soon as you can to extend their lifespan and avoid any bacterial growth. If the mattress has been soiled overnight, wipe the mattress down, and use a disinfectant like hydrogen peroxide to clean the surface. We used both colored water and urine to test out how easy the mattresses were to clean. For normal messes, we made a solution of mild soap and warm water that worked for any stain we left. A mix of hydrogen peroxide and water rubbed on the surface helped eliminate any lingering odors. For messes that have been stuck on the mattress for a longer period of time, perhaps overnight, we recommend starting with the same warm water and mild soap solution, but also incorporating baking soda into the mix. Sprinkle baking soda onto the messy surface and let sit for about 20 minutes. Afterwards, scrub with your warm water and mild soap mix. Repeating this two or three times should yield a crib mattress that’s good as new. Every year a new group of products hit the market. Here are two new models to look forward to: Moonlight Slumber has recently introduced several new crib mattresses, but the one that we’re most looking forward to is the Starlight Simplicity Crib Mattress. This will hit stores this summer and will feature an organic cotton cover, a dual-firmness design, and a natural latex core. It will be free of foams, plastic, polyester and—of course—harsh chemicals. Expect this one to be priced well into the $300 range. BabyLetto, the modern furniture line of Million Dollar Baby, will be releasing a line of coconut coir mattresses that will be priced well below the existing crop of similar models. Coconut coir is prized for being allergen free, and an organic material that’s both firm and long-lasting. They’ll run from $270 up to $330 and have different cover options classified as Coco Dry, Coco Air and an organic cotton version. While they aren’t in stores just yet, they have started to pop up on Amazon. We’re keeping an eye on the Coco Core Air, priced at $290. Infants will spend the better part of the day on top of the crib mattress you choose. We chose the Moonlight Slumber Little Dreamer for its low price, waterproof and stain-resistant cover, and superior materials inside and out. There are good mattresses on the market with more bells and whistles, but they aren’t necessary to achieve good sleep.